Watch to learn how to make a quick spicy creamy chicken soup in your Instant Pot or Pressure cooker. Pressure Cooker Low Carb Spicy Creamy Chicken Soup mixes together pantry ingredients for a last-minute homemade creamy chicken soup that’s simply bursting with flavor. 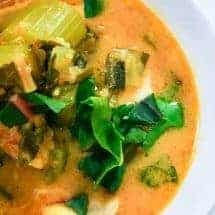 Spicy, creamy, low carb, keto, gluten-free, and dairy-free. Pressure Cooker Low Carb Creamy Chicken Soup mixes together pantry ingredients in your Instant Pot for a last-minute homemade creamy chicken soup that’s simply bursting with flavor. Place onion, garlic, ginger, tomatoes and chilis, turmeric, broth base, and coconut milk in a blender, and mix until roughly purée the sauce. Cook the soup on high pressure for 5 minutes, and allow it to release pressure naturally for 10 minutes. Release all remaining pressure. Add the remaining ½ cup of coconut milk, stir through and serve. Is that 5 cups of coconut milk or .5 of a cup 1/2 cup? 5 ounces? Wonderfully delicious soup on a cold and snowy day. 🙂 Very easy to put together. Will definitely make this soup again!